The view from inside the 120 bus en route to South Beach. RELATED: See Wilson Sayre's race to work, taking a public-transit route from Kendall to Miami Beach against a car commuter. 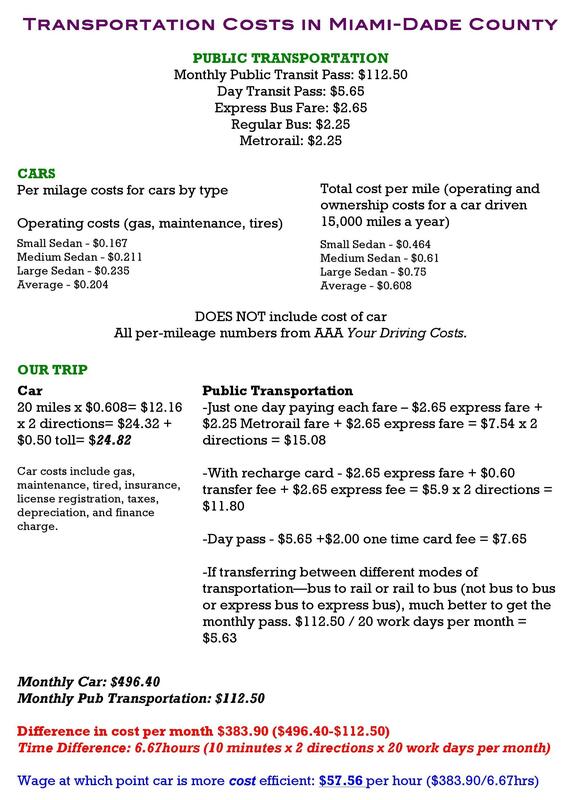 For a regular Miami-Dade public-transit commuter, an all-access monthly pass costs $112.50 a month. That comes out to around $5.63 a day if it's only used on weekdays. For drivers, adding just gas, maintenance, and tires, a small sedan will set you back a minimum of 16.70 cents per mile. That's more than $6 a day for a 20-mile commute each way. Emily Eisenhauer, program coordinator for the office of civic and community engagement at the University of Miami, studies affordable housing. One of the major factors in affordability is a building's proximity to jobs. “Especially for lower-wage workers or lower-income families, when you're making minimum -- if you’re spending three hours commuting every day, that's maybe $20 a day you're losing," she says. "It adds up: $100 a week, $400 a month. That's some people's food budget." In an informal race from Kendall to Miami Beach, a common South Florida commute, my friend Willie Avendano and I set out to see what the time difference is between someone in a car and someone taking public transit during normal morning rush hour. According to Google maps, the commute via public transit requires four transfers and takes one hour and 26 minutes. The same trip by car takes 40 minutes. I rode the bus, and Willie took a decisive victory, arriving at the beach with 10 minutes to spare. It's not a huge difference, but that time adds up. “That’s time that you’re not spending with your family or with your kids,” Eisenhauer says. To Kathy Lane, director of Little Lambs Day Care center in in Allapattah, the biggest consequence of public transportation isn't the cost of longer of commutes, but the reliability of that transportation. “It's a big problem,” Lane says, “because the bus is always late. It takes a lot of time. Once the [buses do] come you’re not guaranteed to get on that bus because it might be crowded … then you have to wait extra time for another bus." The daycare center stays open till 6 p.m. during the week, but every three or four days, Lane has to stay late, waiting for parents to pick up their kids. “You know you give them a set time to be here but you can’t because sometimes the buses aren’t reliable at all,” Lane said. She imagines one reason for this is, “the gas prices going up, there’s more people on the bus." Lane, like Eisenhauer, takes public transportation to work. They are both salaried employees, which, Eisenhauer says, makes a big difference when it comes to the viability of public transit. “One of the things -- and I think most people who ride transit here know -- is that you have to have a certain amount of flexibility. There are just times that you are going to be late,” Eisenhauer says. “For me, not being an hourly worker, I have the flexibility where if I'm not there right at 9 a.m. I'm not going to lose any of my pay. If you’re an hourly worker, you don't have that same flexibility. You have to be there on time." And, she says, you have to budget extra time in your schedule in order to be on time. But if you’re not a 9-to-5 worker, you won’t be able to take express routes or make seamless transfers -- tools to make commutes faster in Miami’s complex transit system during heavy-use times. I lost the race to the beach riding public transportation, but factoring in the cost of a car, insurance, gas, and maintenance, I still saved money -- and lost time. 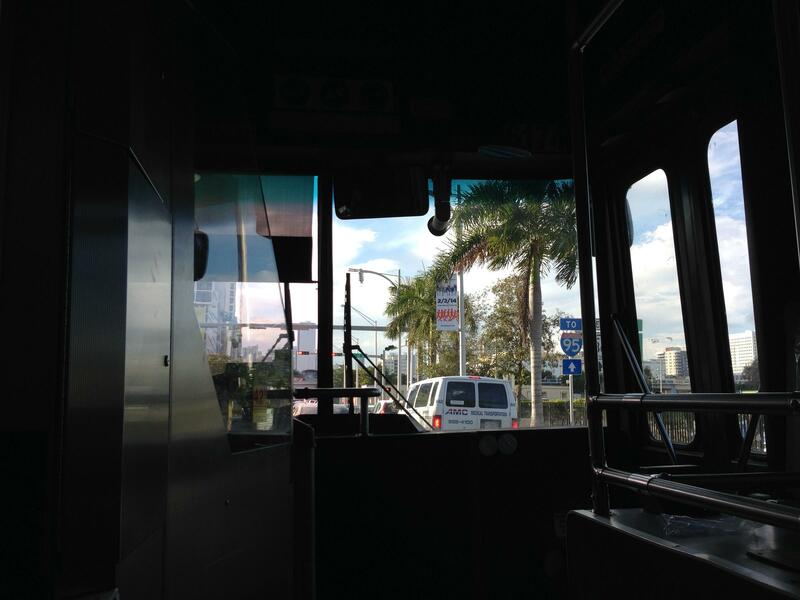 Reporter Wilson Sayre compares a private commute versus a public one, riding the public transit from Kendall to Miami Beach while a friend, Willie Avendano, drives his car. Click on the markers in this map to see time stamps of their journey and hear their banter and narration. Can you guess who won?